Tired of that chicken going up to the guards and being a nark? Annoyed because that one bear ratted you out? Upset because horses are snitches? Then this is the mod for you! Homercide - for making NARC installer! Removed a couple of unneeded factions. Updated Description page with more accurate and up to date information. 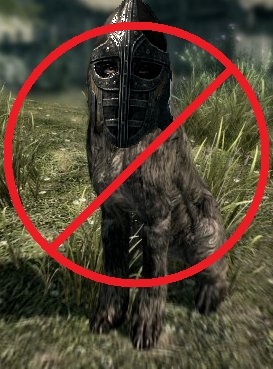 Will only be supporting Dawnguard + Dragonborn version of NARC from now on. The mod is now compatible with Immersive Citizens Overhaul - both FULL and LITE versions. Removed werewolf due to hostile aggro. Properly sorted .esm files in the header for 'NARC - Dawnguard and Dragonborn' version. Added the dog Stump to DogFaction and PlayerPotentialAnimalFaction. This mod will only be incompatible with mods that modify the specified vanilla animal and creature factions shown in Creation Kit or TES5Edit. If any conflicts are found, I will report them here. Compatible with Skyrim Immersive Creatures v6.5.2b. Use consistency patch provided in Files. Compatible with Immersive Horses v1.9.Use consistency patch provided in Files. Compatible with Convenient Horses v5. Use consistency patch provided in Files. Compatible with One With Nature v2.1. Compatible with Immersive Citizens Overhaul v0.3.1. Compatible with SIS - Stealth and Immersion Set v3.5.1. Must load SIS BEFORE NARC. Compatible with Path of Shadows v1.7. Must load Path of Shadows BEFORE NARC. Compatible with Unique Dogs v1.2. Must load Unique Dogs AFTER NARC. Load only the mods you are using that conflict with NARC and the core NARC.esp plugin. If you want to make a separate plugin, just copy and paste the plugin and rename it. Click the + symbol on the NARC plugin you loaded. Then click the + symbol under the Factions and NPC header. Check for any discolored lines indicating there is a conflict or overwrite (yellow or red background). In the right pane window, drag and drop those record changes in red from the left columns over to your new merged plugin's column. Exit TES5Edit and save. When you are done, you can rename it to whatever you'd like. ~ For a visual tutorial, click here :D.
<*> If you are using any mod such as SIC, IH, CH, etc that adds new custom factions/creatures, my changes will not carry over to their new factions. this won't make them incompatible, however, it means that a consistency patch will be necessary. In other words, NARC will still make its changes to the listed vanilla factions, just not to the new modded ones. If you wish to make a consistency patch, all you need to do is make the same changes NARC makes to the mod's new factions in TES5Edit. There will be some optional pre-made consistency patches in the Files section. These can be combined freely, including as an xEdit Merged Plugin, with as many consistency patches as you may need. NOTE: The listed factions are ALL covered by NARC. The highlighted factions are covered by BOTH USLEP/USKP and NARC. Which factions will ignore all crimes? Farm Animals - Covered by USKP/USLEP - DOES NOT include fox, hare, dog, etc. Player Housecarls - "Sworn to carry all my burdens, eh?" Which factions will ignore some crimes? Bandits - ignore all crimes except werewolf crimes. Thieves' Guild - Ignore pickpocket, theft, and trespassing crimes. Frostmoon Vender - Ignores werewolf crimes. Q. Do I need this if I already use the USKP or USLEP patch(es)? A. Yes. While you don't technically need it, you should still have it as much as you plan on having the Unofficial patches. The Unofficial patches only cover the factions I've highlighted in yellow. Every other listed faction can still report crimes without NARC. Q. Will you support users who do not own both of the Dawnguard and Dragonborn DLC? A. I am no longer supporting vanilla or single DLC Skyrims. The game has been out for 5 years now and has seen plenty of affordable sales for Legendary Edition Skyrim. It is easier for everyone if users make the small investment.